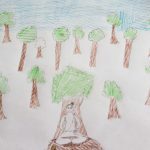 In a forest, on the banks of river Ganga, lived Sage Jamadagni with his wife Renuka and their sons. 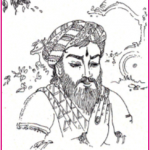 Sage Jamadagni was known for his austerities, penance and his adherence to dharma. Lord Parasurama, an incarnation of Lord Vishnu, was his youngest son. Mother Renuka used to go to the Ganga to fetch water for the sacrificial offerings that were performed by Sage Jamadagni. During one of her visits to fetch water, she saw Chitraratha, the king of the Gandharvas playing with other celestial women in the Ganga. He was decorated with a beautiful garland of lotuses, and it was an enchanting sight. Mother Renuka was lost for a while and forgot that the time for the sacrifice was passing. As soon as she realized her mistake, she rushed to the ashram with the pot of water. There, out of fear, she dropped the pot when she looked at her husband, as she felt guilty that she had been distracted by her senses and neglected her duty. Jamadagni immediately realized the cause for her delay and became very angry. Renuka trembled out of fear of his curse. The sage ordered his sons to kill their mother for her negligence. But the sons did not follow his order. 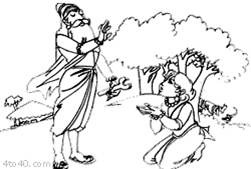 Jamadagni then ordered his youngest son, Parasurama, to kill all his brothers for disobeying their father and kill his mother for her mistake. 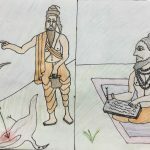 Parasurama, who was none other than the Lord and who knew the ways of dharma and its consequences, immediately obeyed his father’s words and killed his brothers and mother. This act of Parasurama’s pleased the father very much. The happy father offered his obedient son a boon. Lord Parasurama then replied saying, “Let my mother and brothers live again and not remember having been killed by me.” At this request of Lord Parasurama, Jamadagni gladly brought them all back to life. Such was the respect and obedience Lord Parasurama had for his father Jamadagni, who was a great sage and follower of dharma. The father is one’s foremost Guru. His advice is always born out of love and concern for us, and is enriched by his experiences in life. However stern they may sound or unfavorable they may seem, ultimately his advice will mean only good for us – we may be too shortsighted to understand their purport! 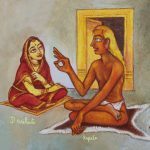 One Response to "Adherence to a Dharmic Father’s Words…"
Good article for Father’s day.